This painting was done in the back seat of my car. On the way to Germanton, NC I stopped at a little town just below Hickory, NC named Startown. 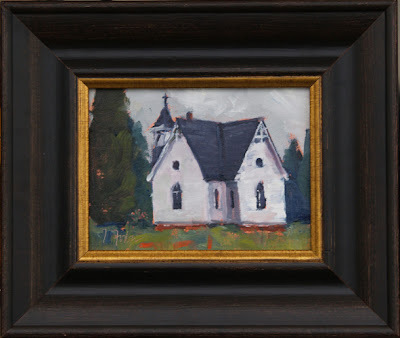 This sweet little church was on Startown road. As I painted this I thought this would be a perfect place for an American Idol contestant to be from. 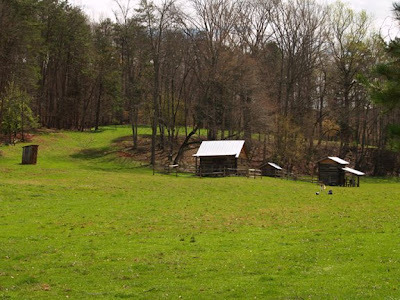 Once I arrived in Germanton, NC I found this great farm just accross the street from the home I stayed at for 3 nights. (More on my gracious hosts in another post.) The farm, Buffalo Creek Farm, was a fun place to paint and one of the owners, Robin, shared alot of interesting farm stuff I didn’t know. I painted this on a foggy/rainy day. Luckily, I found a great shelter and painted the back of the barn/house. This farm had llamas, guinea fowl, goats, rabbits, turkeys, Great Pyrenees dogs. Some animals had special duties on th farm. The guinea fowl are said to be good for controlling the Lyme Disease-bearing deer tick. The Great Pyrenees dogs protect the livestock and are rarely out of sight or hearing of his flock. It is a calm animal that moves slowly to avoid disturbing the livestock and possesses a better than average sense of hearing, sight and smell. Llamas bonds with its herd of livestock, it takes over as a protector. 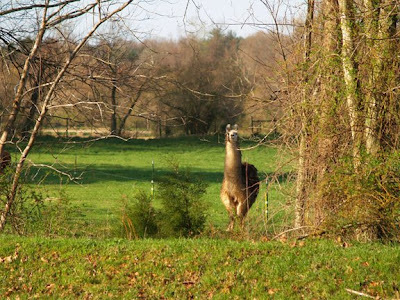 Friday, I “forged” their Buffalo Creek to paint their restored log cabin and one of their llamas kept his eye on me as I crossed the pasture. 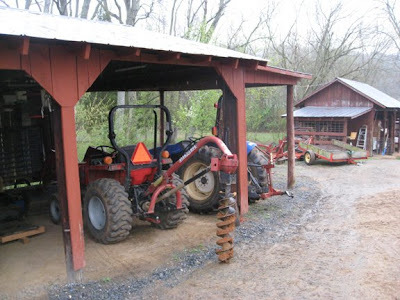 I used the second shed pictured here as shelter to paint the barn/house – see my easel next to the ladder. 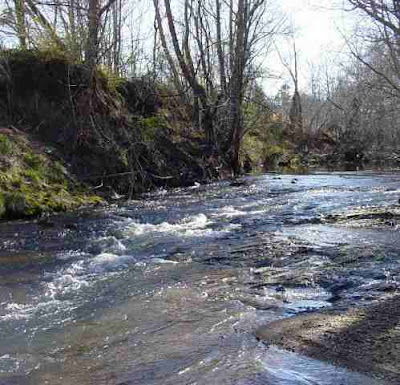 Friday I forged this stream to paint in Buffalo Creeks back pasture. This llama was keeping his eye on me. Friday night Germanton Gallery held a reception for 30+ artist they invited to be a part of this paint-out. It was a fun evening and I meet some really nice artists from all over the country. One artist, whose work I admired, was Robert Brown from Charlotte, NC. 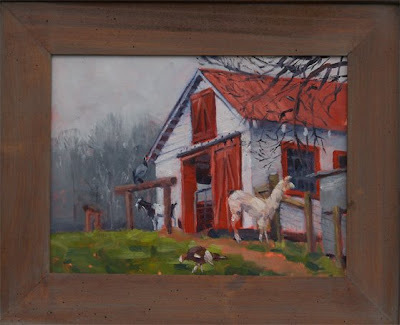 This entry was posted in art gallery, artist, dogs, drawing, goats, plein air painting, rabbits on April 6, 2009 by Isabel.